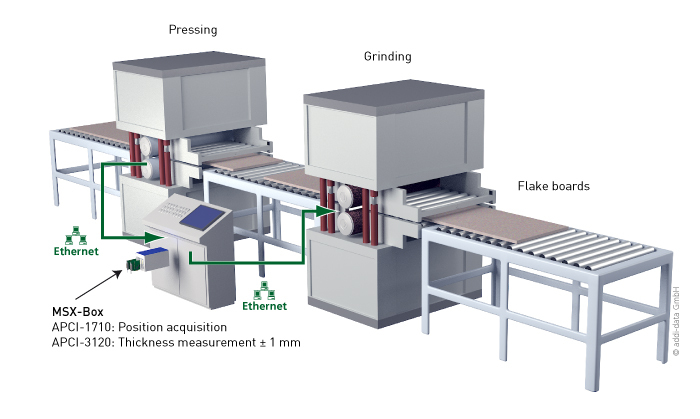 A manufacturer of flake boards has the following objectives for the modernisation of his production facility: Save material, glue and energy costs, reduce the wear of the grinding belts and optimise the time for the press process in order to improve the productivity of the complete manufacturing process. The measurement and control system must cope with a high production speed and data volume. After the press process the real-time PAC system MSX-Box measures the thickness of the flake boards with a precision of +/- 1 mm. The MSX-Box is equipped with the analog multifunction board APCI-3120 for the acquisition of laser signals and with the counter board APCI-1710 for position detection. Measurement and position values are acquired in real time for data consolidation, in order to position the grinding belts exactly and to execute precisely the rework. The acquired data is evaluated to adapt the amount of material and glue before the press process.